The seafood feast you made was amazing. It was also two days ago and the house still smells like Fisherman's Wharf. But it won't for long with Fresh Wave® Soy Candles. Light a natural Soy Candle in the kitchen while preparing your meals to eliminate cooking odors before they spread. Or use one after food preparation to remove lingering odors. 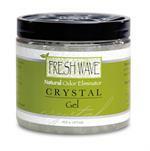 The entire Fresh Wave line features our proprietary blend of natural extracts. This combination of lime, pine needle, aniseed, clove and cedar wood safely eliminates malodors without adding a masking fragrance or harsh chemical to your environment. Candles are the most effective way of dispensing this special odor neutralizing formula. So for active families who love to cook at home with creative ingredients, have pets or children, its the best product for eliminating odors. A perfect gift for any gourmet cook, the Fresh Wave Kitchen Candle is as beautiful as it is effective. To keep odors from fish, onions, garlic, curry and any pungent ingredient from lingering after your meal simply burn the candle during preparation and again after eating. The 7 oz. ecru candle comes in a frosted glass that blends with any decor. Plus it will look beautiful (and be effective) anywhere you may need strong odor neutralizing: in the bathroom, your workout room, a guest room, or the library. Just open a jar to deodorize any room or area - such as a basement or bathroom. Then allow ambient airflow to activate the unscented odor control gel for the whole room.